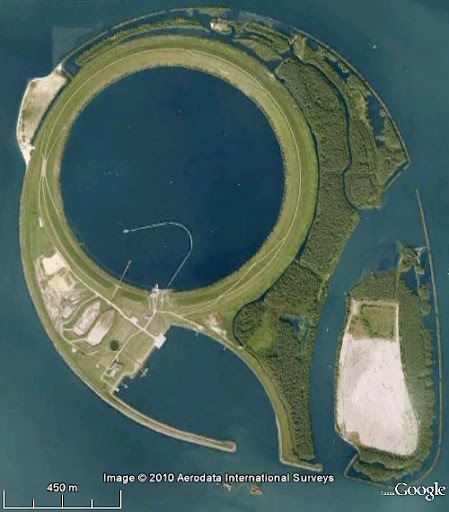 IJsseloog (meaning Ijssel's eye) is a one Kilometre across and 50 metres deep circular tank made inside the lake Ketelmeer (English: Lake Kettle) in The Netherlands. It is so huge that it is referred as a depot and not a tank. It is part of the world's largest, most environmental friendly and technologically advanced dredging project which aims to clean the Ketelmeer - a lake at the mouth of River IJssel. After the end of the WW-II, large scale industrialization along the river Rhine and Ijssel resulted in high built up of sludge in the bottom of Ketelmeer to the extent that it not only became unusable but also posed health hazard due to presence of toxic substances and metals such as cadmium, nickel, lead, arsenic, mercury, chromium, copper and zinc etc. There were also fears that the pollution would also spread to the adjoining lake IJsselmeer which is connected to the Ketelmeer by the River IJssel. One of the main problem faced in using the normal dredging was the disposal of the contaminated sludge removed from the bottom lake. The engineers therefore decided to build this giant sized permanent storage depot within the lake itself to avoid contamination of nearby agricultural land. The depot has capacity of 23 million cubic metres to hold not only sludge from the lake but plus another 5 million cu. m. of contaminated sludge from elsewhere. Construction of IJsseloog was started in 1996 and completed in 1999. The dredging work of the lake is now in progress and will take 15-25 years for filling it totally. In order to prevent seepage of contaminated sludge from the depot back to the lake, the inside wall of the depot has been has been lined with foil and the bottom is sealed with thick clay. When the depot is full, it will be sealed with layers of clay and sand, and then nature will take over. The artificial Island so created will be turned into a natural reserve for the fauna and the flora. Once the dredging is complete the lake may also be used for commercial shipping.